All our soaps start with vegetable oils good enough to eat. The excellence of our soaps comes from the integrity of our basic ingredients. We use only food grade oils to nourish your skin. By blending four base oils—olive, rice bran, palm kernel, and soy—we craft a bar of soap that's moisturizing, long-lasting and luxuriously lathering. To convert the oils into soap, we add lye, sodium hydroxide. Don’t fear; there is no lye left in finished bars. The fatty acids and the lye neutralize each other and form a salt called soap. Basic chemistry. During the process, glycerin is formed from triglycerides. The glycerin is a natural by-product of “cold process” soap making. It composes about 8% of each bar. Glycerin feels silky smooth on your skin. It’s a humectant, gathering moisture from the air. You can pronounce the ingredients in all our products. You can trust all of our products to contain only plant-based ingredients (other than distilled water). We use no synthetic preservatives, no petroleum products, no triclosan, no phthalates, no formaldehyde… The list of what we don’t include is frightening. We also offer oils and butters to use as moisturizers. You'll find them more effective than conventional lotions. 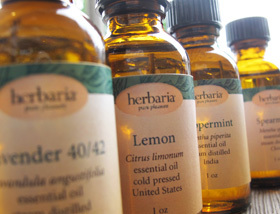 The aromas in Herbaria soaps and products come from essential oils derived from plants. We are careful to select oils from sustainable plants, avoiding those from endangered species such as sandalwood or rosewood. 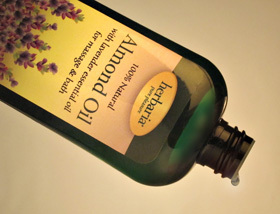 Read more about the benefits of essential oils. 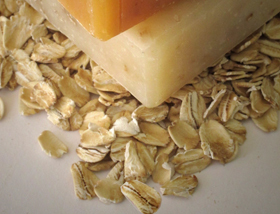 The primary texture we add to our soaps is oatmeal. It is unsurpassed for exfoliating and soothing your skin. As for colorants, we choose herbs and clays, no synthetic colorants.